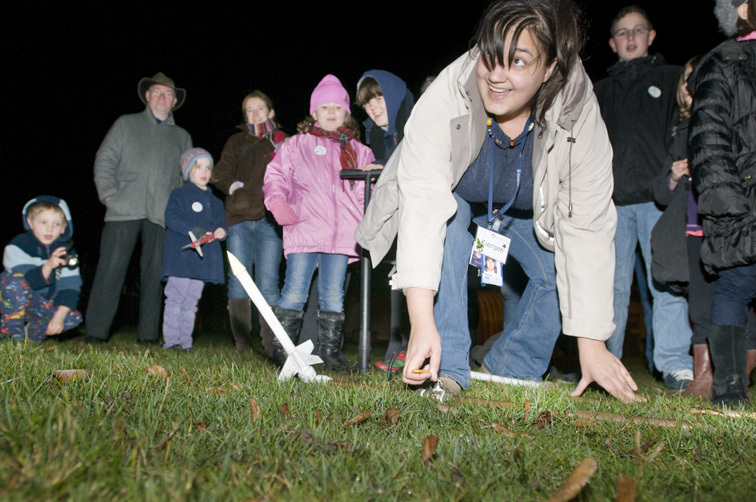 In support of the Rutherford Appleton Laboratory's outreach programme, the National Space Academy Regional Project Manager spent the evenings of Wednesday the 9th and Friday the 11th of January launching hundreds of paper "rockets". Both events were incredibly well attended, with over 2000 people attending the Wednesday event at Newbury Racecourse. There were plenty of activities for visitors of different ages, and the skies even cleared enough for budding stargazers to view Jupiter and its moons through various telescopes brought by volunteers. Next week sees the return of BBC2's Stargazing LIVE for its third series. As in previous years the television shows featuring Professor Brian Cox and Dara O'Briain broadcasting from Jodrell Bank will be complemented by events across the country encouraging the public to get involved in astronomy and science. The National Space Academy will be involved in events at Long Eaton, Newbury and Harwell as part of Stargazing LIVE with members of the Academy team bringing their expertise and enthusiasm to new audiences. 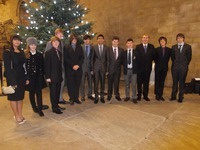 Last Wednesday students from the National Space Academy's Space Engineering course attended the Parliamentary Space Committee's Christmas Reception. The students took centre stage after a glowing introduction in which National Space Academy Steering Group Chairman Ian Taylor read out a letter of endorsement from Professor Brian Cox. The National Space Centre hosted the first of two days of training for staff from ten different science centres as part of the Explore Your Universe project. Explore Your Universe is being run by the Association of Science and Discovery Centres (ASDC) and aims to engage school and family audiences with STFC science through activities and workshops. Ian Taylor, a former MP and Minister for Science, Technology and Space, has been appointed chairman of the National Space Academy's Steering Group. The UK Space Agency, one of the National Space Academy's key funders and supporters, has teamed up with the Nottingham Geospatial Institute, including National Space Academy Project Scientist Dr Simon Roberts, to run hands-on educational sessions based at the European Space Expo in London this December. Project Director Anu Ojha (AST Physics, 2003) and Lead Educator Judith Green (AST Chemistry, 2002) have been invited to present sessions at the 2013 National AST (Advanced Skills Teacher) Conference in Birmingham in January 2013. AST status is awarded for outstanding performance in the classroom and is the most rigorous assessment of teaching performance in the UK. National Space Academy Director Anu Ojha is also an experienced skydiver with over 1200 jumps completed. His analyses of the scientific challenges and applications of the Red Bull Stratos mission have been used by media across the world, especially after Felix Baumgartner successfully made his jump from the edge of space yesterday. National Space Academy Education Officer Sophie Allan has been working with staff from Jodrell Bank on an Association of Science and Discovery Centres (ASDC) project funded by the Science and Technology Facilities Council (STFC) aimed at sharing STFC funded science with the wider community. "Explore Your Universe" is a project providing ten science centres with a variety of exciting apparatus, not usually available to schools, with pre-planned workshops and shows aimed at audiences including families and school groups. The ten centres which successfully submitted bids to be a part of the project were announced on Thursday 27th of September at the ASDC Conference held at the National Space Centre. Last week saw the first ESERO-UK conference for organisations in the UK promoting space as an inspirational context for education, hosted at the National Science Learning Centre, York. Naturally representatives from the National Space Academy were in attendance, including some of the Academy's Lead Educators.